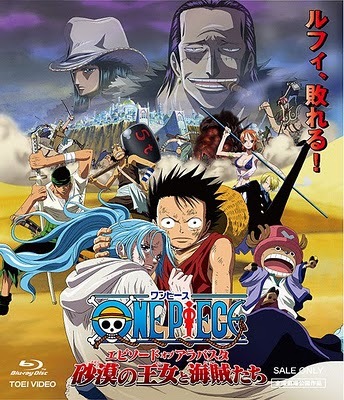 The Straw Hat Pirates travel to Alabasta, the desert island and home of Nefertari Vivi. They find the country in the middle of a revolution. Crocodile, the country's hero, secretly used his criminal organization, Baroque Works, to undermine the citizens trust in Cobra, Vivi's father and head of the Kingdom of Sand, in order to seize the throne and the countries hidden secret for himself. The crew now has to cross the desert, stop the revolution, save thousands of lives from Baroque Works hidden bombers, and most of all, defeat Crocodile, one of the mighty Shichibukai.